*This will be my last microadventure style post to celebrate my completion of walking 1000 miles in 2017. It seemed such a perfect few days to have snow up in the welsh hills. Timely in fact for December although, it was our second covering of the year, only this time much thicker. and use the banks of the woodlands to whoosh down, only to be taken out by a root, or a tree! On the first morning, I woke early, there's was an intense glow above my curtains. There had been no tractor sounds or from passing cars. Something was different. The anticipation of peaking behind the curtains was a little too much for me, and instead, I dragged them back to expose a shocking white mass of the ol' white stuff. My pup was out of the door before me. Over the next 4 days, we enjoyed sledging, hill walks, and snowman building. Oh, and there was a case of a lost and never to be found glove of mine, from a late-night, escapaedeinto the village to collect supplies (mince pies). best to clear it away each night more fell from the sky. There's something quietly deafening about snow. You can hear a pin drop. There are no echoes in the valley, and each crunchy footstep I took got louder and louder and I found myself tiptoeing, hoping not to disturb the jittery Robbins or resting sheep! The roads in the small villages were filled with people rather than cars, all snowball fighting, chatting, laughing, and enjoying what nature had to offer us in abundance.One morning, we woke to the most azure blue sky one, could ever ask for - my home looked exactly like it does on those winter travel brochures! I feel utterly blessed I got to finish off my 1000 mile challenge at home in the snow. My walking adventures have taken me to some amazing locations but there really is no place like home. On wintry nights when the sky is clear and the air still, Jack Frost creeps across the countryside. His cold breath and icy finger-tips spread frozen tidings through the atmosphere and across the ground. Feathery patterns trespass over window panes, forming fern-like arabesques on their cold, smooth surfaces. 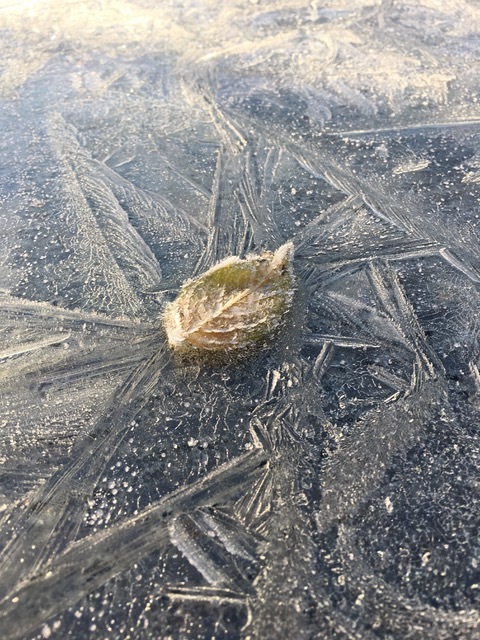 While it is easy to imagine these as the unfurling of some winter’s magic by a mischievous figure of fun, the florid patterns that form on our car windows and glass-topped patio tables are caused by a chain reaction of slowly gelling water. As the spreading frost crystals meet imperfections in the surface such as specks of dirt or scratches, they branch off in new directions forming intricate, wintery patterns that are a joy to discover. In deepest winter, when the weather is at its most solemn and still, comes the thick, spiny coating of the hoar frost. Trees are silvered; leaves and grasses powdered. The countryside takes on a wintery whiteness that is crisper, more defined than the blanketing softness that comes with a fall of snow. The name “hoar” derives from the old English word “hor” or “har” for white or grey, and describes the appearance given by the mass of tiny ice crystals which scatter light in all directions so that everything coated with them appears white. For the crystals to form the conditions have to be just right. If both the air temperature and the dew point (the temperature at which water vapour in air condenses into liquid water) are both below freezing, a process known as sublimation takes place. The moisture in the atmosphere turns from vapour to a solid (ice) without first passing through a liquid stage. This is all takes place as we sleep, warmly tucked up under our blankets and with our hot water bottles. And when we wake on a wintery morning to the chill of the first frost – to find the windows etched with the tracery of window frost or to gaze at the frozen wonderland created by a hoar frost – we experience one of the season’s most defining moments. high boulder banks and the dune’s downslope. Another swarm of dreams is scattering south. its own meandering echo chambers. and scorch this great dark bore hole to the moon. each shiny new angle geared for flight yet still grounded come first light of morning. In a world that is in love with days that glow with the warmth of sunlight, the humble grey sky gets a pretty bad rep. What is there to love about the cool and the quiet of a cloudy, rainy day when the sun is hidden away and hibernating? There seems to be a universal consensus that the arrival of grey skies and rainy days ruin the best-laid adventure plans. Who wants to hike in the rain? Who wants to visit the coast when the sun isn’t shining? Well, to that I say, “never underestimate the power of an overcast day.” Some of the best adventures, some of the most memorable and inspiring days in the great outdoors start with a muddy puddle and drizzle dripping from the sky. When a day is bright and the sky is blue, everything is presented exactly as it is: there is no mystery. On a rainy day, when the oppressive clouds come down from their kingdoms in the sky and perch on the tops of hills, the edges of the world begin to blur and the imagination is encouraged to run free. Instead of the crystal blue clarity of sunshine, a grey-skied day evokes a magical sense of wonder, in which anything and everything could be possible. Just look at the classic fairy-tale tropes: no story full of magic and mystery, myth and adventure begins on a day that is without the tell-tale rumble of thunder or the swirling mists that dance through the forests. A grey day is not simply preferable for a story to begin: it is necessary. A blue sky presents the landscape as it is, but a grey sky presents a landscape with hidden factors, with layers of interpretation and meaning and reality. The landscape becomes our own and our imagination shapes it. Clouded mountains become sleeping dragons, rainy forests are suddenly home to all manner of mythical creatures, ghostly cloud-shapes haunt landscapes that otherwise would have been unremarkable. “Wuthering Heights” just would not have been the same if Cathy had wandered the moors, getting lost under a bright, shining sun. The grey, rainy weather was essential to creating the evocative, haunting moods captured in the novels by authors like the Brontë sisters and it still remains essential, all these years later. Grey skies allow us to connect with our inner child. All we have to do is lose our heavy cloak of adulthood and look at the world with wonder, with curiosity, and with an unceasing optimism. Wander through a landscape that is damp with mist and mizzle and don't hide under the brim of umbrellas or hoods. Look ahead and find shapes in the shadows, dance with folklorish creatures, remember that this landscape is charged and energised by the dark, dreariness of the weather. Learn to associate grey with beauty, mystery, imagination, charm and unlearn the disappointed fear we all possess when a grey day rolls around. Grey-skied-days are a magical, in-between space between reality and fantasy. Embrace them. springing from their own short seasons. each tiny flake was already a window. There’s a winter promise in the air. Taking the dog out for a final stroll late at night, all the signs are there - the sky is clear, the moon bright, and the temperature has dropped rather drastically. He’s on his way. And sure enough, in the morning, whilst still sleepy and warm under thick woolen blankets, I somehow can feel his presence. I’ll admit, it still takes me awhile to get out of bed, but I know that his intricate handiwork awaits admiration. Jack is quite the lad. As if by magic, the first hard frost of winter has changed the landscape as we know it. It’s an unfamiliar familiar. The lines of the hills look transformed. Overnight, he’s preserved the last glimpse of late summer in crystallised flashes of purple heather and turned spiders webs into new artworks. At this time of year, when nature seems to be coming to a close, Jack Frost forces us to see life from a different perspective. He’s an overture to the fourth movement - the finale before a new symphony begins in Spring. Taking time to look at the little things can be breathtaking. Growing up as an inquisitive child in the countryside, I am grateful that it’s now second nature for me to seek out the small details that each season gifts us. And on that morning as dawn broke and the sunrise cast a warm glow across the valley, I was able to capture the fleeting beauty of Jack’s miniature creations as they disappeared before my eyes. As the first rays of the morning light broke through the trees and landed on Jack’s crystal carpet, it felt almost magic like. A glistening, shimmering wonderland. And while the droplets of water were frozen in place, I worked quickly to capture them in time. I hope you will agree, it was something to get out of bed for. The promise of a new season is a thrill. Watching, waiting for those first signs that change is afoot never gets old, perhaps because we're never quite sure when they will appear. Though December to me feels like winter, and though it is the month I've selected to release the winter issue of the magazine, it isn't cut and dry. Autumn's fragments are still evident in soggy piles of leaves by the side of the road, and the wrinkled conker shells up the footpath, and will remain, no doubt, for some time yet. Winter is the quiet season. It is a time for reflection, contemplation, and a moment of stillness before life once again springs forth. It is an opportunity to spend dark evenings curled up with a blanket and cup of something hot, with a good book. I honestly can't remember the last time I read a book from cover to cover, but I know that of all the seasons, I love reading about winter the most. These are the books on my bedside table this winter. Dorothy Wordsworth's Christmas Birthday by Carol Ann Duffy. Set on Christmas Eve in 1799, Duffy's poem takes us to the frozen landscape of the Lake District. With beautiful illustrations by Tom Duxbury, it's the perfect little book to get you in the festive spirit. I also love that it's short enough to read in one sitting, and lasts about as long as a hot chocolate. My husband loves astronomy, but I'm really more of a beginner. That's not to say I don't enjoy locating key constellations, and it's a brilliant excuse to get outdoors at this time of year. Even better is that it gets dark incredibly early, and unlike the summer months, a spot of stargazing can take place early evening. Take a torch out and use a guide to map the sky. Another short book, Sedgwick imitates the six sides of a snowflake through the six chapters, exploring art, literature and science of snow, as well as his own experiences and memories. He suggests that "snow is transformative. It changes the world around us... Overnight, it repaints the landscape in white, inevitably bringing to mind concepts like purity and clarity of thought. Over the course of eons, it can remake the earth itself." Part of the collection of anthologies for the changing seasons, this one is my favourite. Particular highlights include Satish Kumar's approach to wildness, and Kristian Evans' thousand words for snow. If any collection of stories is likely to awaken nostalgic feelings of early childhood, then it's this one. "Outside there is no surprise in the coldness of the morning. It lies on the valley like a frozen goose. The world is white and keen as a map of the Poles and as still as the paper it's printed on. Icicles hang from the gutters like glass silk stockings and drip hot drops in my hand as I breathe on them." And of course, there's the winter issue of Creative Countryside if you're more in the mood for a magazine. Winter is also the best time to linger in a hot bath. I think I've probably managed three or four baths since my son was born (he's almost nine months now) but I'm determined to make time for more over the festive season. The wonderful folk at Magic Organic Apothecary sent me their new Dreamy Mineral Soak to try, and it's truly the best bath product I've ever smelt. With a healing blend of lavender, pine, cardamom and Himalayan pink salt, it's perfect for soothing aching muscles and purifying the skin (ideal for winter). Above all else, and as Edith Sitwell recommends, "winter is the time for comfort, for good food and warmth, for the touch of a friendly hand and for a talk beside the fire: it is the time for home." Magic Organic Apothecary Dreamy Mineral Soak was sent as a gift, but there was no expectation of review or endorsement. I only include it in this post as a product I would genuinely recommend. Today I'm delighted to introduce the first in a series of seasonal posts by Cheryl, a writer and advocate of simple living currently living with her family in a beautiful Romanian village. For more, head over to her blog and inspiring website. Once upon a time, in a far-away land, there was a little village surrounded by orchards and fields dotted with ochre haystacks, full of women and men meaningfully wandering through the fenceless landscape, carrying handwoven baskets on their backs in the sun, in the rain and in the snow. And this winter, in our fairy-tale village of Breb, Romania, this real place on Earth which our family calls home, the recent cold and snowy months have been dreamlike, in the most frozen and wintry sense. Temperatures have dipped to -20°C for nights on end, pipes have frozen and flowing water has turned the streets into thick glaciers, providing entertainment for the young sledgers who race downhill, screaming with laughter at high speed all the way. But to walk on such ice, to visit a neighbour, or go downhill to the village shop is a matter of slipping, sliding and by some skillful act of balance – not falling down. Here, the cold comes with simple beauty. The ice flowers that grow overnight, present themselves in the morning light. The foothills are covered with white, glistening magic. The smell of burning fir and alder fills the air as the smoke billows from small chimneys attached to wooden homes. As we step outside, we inhale life and death as we become part of this ethereal landscape. The smoke is a reminder of the trees that are harvested in the foothills of the Gutâi Mountains, the very thing that keeps us warm and alive. In winter, it seems that wood is harvested every day, felled by chainsaws and brought down from the hills by horse and sleigh, the exception being Sunday when no work is allowed. I put another log on the fire with hope deep in my heart that come warmer weather, in another season, I will see seedlings being planted on these very hills, for if they were to be thinned to the point of lace work, what would these traditional wooden houses be born of instead? Concrete and bits of styrofoam hopefully will not overtake this romantic existence, but like the loss of craftsmanship, only time will tell. So, as we deeply slumber under heavy, handmade woollen blankets, woven from the fibres of the Țurcana sheep, we dare consider the reverie of spring – trees filled with flowers in the billions, and of birds chirping their sweet songs. Adventure awaits higher up the forested hills, near the peat bogs of Morărenilor Lake, on the Creasta Cocoșului (Rooster’s Crest) and in walking barefoot among gentle blades of green while foraging for all that disappears in winter. To live simply among the seasons has never been so enchanting, or so full of mirth. Usually celebrated on February 2nd (or the eve of February 1st), Imbolc (pronounced 'im'olk') is one of the four Celtic fire festivals that make up the wheel of the year, and celebrates the passing of winter and the return of spring. It comes at a time when many of us are longing for the end of cold, dark days, and serves as a reminder that brighter mornings and new growth are on the horizon. As Imbolc is also St Brigid's Day, celebrations of this Celtic fertility goddess are also held to signify her transformation from the crone of winter to the maiden of spring, and often take the form of lighting candles, fires, and celebrating the sunlight. Appropriately, snowdrops are one of her symbols, and form as a further reminder that the bleakness of winter is waning. The day is also a great opportunity to reassess any goals you set yourself back at the start of January, as the start of spring we plant the seeds that will grow and nourish us for the rest of the year. Spring-clean whatever you want to be rid of (both literally and metaphorically) and set forth on a new journey of optimism and hope. You could also plant some actual seeds to symbolise the promise of this new season. Head over here for more ideas on how to celebrate the festival. If you're a subscriber, you'll have already received the first edition of the newsletter - A Seasonal Year - but if you're not don't worry, because today's post offers a compact version to inspire you to live slowly and seasonally throughout the winter months. Don't want to miss next month's newsletter? Prepare the house for colder weather: light candles; get a stack of logs ready for the fire; choose rich, jewel colours for your accessories; choose a reading spot; and festoon your home with greenery. Embrace daylight whenever possible: get outside for a walk at least once a day; position yourself near to a window when working; try and watch the sunrise and sunset as often as possible. Plan for the year ahead: choose a word (or two) to focus on and set long-term goals; order seeds for the vegetable patch / allotment / kitchen windowsill, and plan out your summer harvest. L-R: Burial Rites by Hannah Kent; Village Christmas by Laurie Lee; A Christmas Carol by Charles Dickens. The early morning temperature is hovering around four degrees centigrade, which is quite mild for winter, but when only a thin layer of fabric separates you from that cold air, it doesn’t feel it. I dress quickly and for warmth, though the first layer against my skin feels like damp ice. Poking the embers of last night’s fire, we’re tempted to light another, but daylight is seeping through the fibres, and the blackbird is already welcoming the day with a tune. Instead, we don colourful knitwear and walk the short distance up to the bridleway with Bella. The footpath leads vertically away from the village, cutting through the four-and-a-half acres of our land, before hugging the hedgerows the rest of the way, and ending up behind the house we’ve left behind. In summer, you can see as far as the wooded pheasantry to the left, and the radar golf ball to the right, a spherical and unusual addition to the arable landscape. Today, however, fog shrouds the fields, and the air is so thick and cloying that I can only make out the base of the tree trunks, squat and steady. Walks this early are usually silent, as we let our senses adjust, and Bella disappears into this quiet, shadowy world, becoming part of a fairy-tale with Little Red Cap, Hansel and Gretel, and the Snow Child. Lost innocents, drifting. I whistle for her return, and on the walk back, pocket changes in the season: the slow blush of berries on the hedgerow; hoary cobwebs dripping with dew; the red breast of the robin. These images are forever immortalised in Christmas cards and literature, yet here they are, still existing, still real in this village edgeland. A magpie darts over the robin, before perching on a branch not too far away. From a distance, its tail looks like a dark, unopened fan, feathers clustered like folds waiting to be unfurled. I whisper under my breath the old-age lore - one for sorrow – before looking desperately around for a second – two for joy – I see nothing. Brushing aside superstition, I duck under the dripping archway of branches that mark the entrance to our second field. The land belongs officially to my parents, who have built not only their home here, but also a self-reliant lifestyle. Ducks uark in the distance, and chickens peck at fallen apples in the orchard to our left. The sheep in the top field are scattered in their pen, and don’t seem to mind the ever-changing weather. Although the temperature is waning, there is still produce to be picked in the vegetable patch: curly tendrils of kale, strangely-shaped carrots, and rainbow chard that seems to last forever, impervious to anything but the cooking pot. It is this simple existence that we have come to join, building our own house and becoming a part of the daily routine. But bricks and mortar seem a long way off. This month is all about getting through the last leg of winter, keeping warm on an evening and making the most of fresh produce. I've been inspired recently by colour in food and have been searching to create a visual feast as well as a tasty meal, and in February colours can fire up every plate if you know what to look for. Why not try a carrot and red pepper soup for a vibrant red lunch or quick dinner? Purple sprouting broccoli is also in season and is so much tastier than the broccoli you usually find in supermarkets - eat it stalk, leaves and all as a side dish. Rhubarb is just starting to appear on the shelves in its forced form and offers sweet, earthy flavours best enjoyed in a hearty crumble or as a purée served atop crunchy cereal and yoghurt at breakfast-time. Its pink tinged stalks offer further colourful delights, or for an alternative fruity start to the day blood oranges are still in season - delicious freshly-squeezed. Other vegetables to try this month are cauliflower (creamy cauliflower cheese anyone?) and leeks. Try both alongside any cheese as a side dish or add leeks to a casserole or soup for supper on cold evenings. Leeks also work well in any pasta dish or enjoy them roasted alongside carrots and parsnips. Add a joint of meat and you're in for a happy evening; this week we're slow-cooking a leg of lamb to enjoy alongside the vegetables and apple and mint jelly - a perfect pre-Spring treat.